The little known story of the unlikely friendship of two famous figures of the American West—Buffalo Bill Cody and Sitting Bull—told through their time in Cody’s Wild West show in the 1880s. It was in Brooklyn, New York, in 1883 that William F. Cody—known across the land as Buffalo Bill—conceived of his Wild West show, an “equestrian extravaganza” featuring cowboys and Indians. The idea took off. For four months in 1885 the Lakota chief Sitting Bull appeared in the show. Blood Brothers tells the story of these two iconic figures through their brief but important collaboration. Blood Brothers flashes back to 1876, when the Lakota wiped out Custer’s 7th Cavalry unit at the Little Big Horn. Sitting Bull did not participate in the “last stand,” but was nearby—and blamed for killing Custer. The book also flashes forward to 1890, when Sitting Bull was assassinated. Hours before, Cody rushed to Sitting Bull’s cabin at Standing Rock, dispatched by the army to avert a disaster. Deanne Stillman unearths little told details about the two men and their tumultuous times. Their alliance was eased by none other than Annie Oakley. When Sitting Bull joined the Wild West, the event spawned one of the earliest advertising slogans: “Foes in ’76, Friends in ’85”—referring to the Little Big Horn. Cody paid his performers well, and he treated the Indians no differently from white performers. During this time, the Native American rights movement began to flourish. But with their way of life in tatters, the Lakota and others availed themselves of the chance to perform in the Wild West. When Cody died in 1917, a large contingent of Native Americans attended his public funeral. An iconic friendship tale like no other, Blood Brothers is truly a timeless story of people from different cultures who crossed barriers to engage each other as human beings. And it foretells today’s battle on the Great Plains. Deanne Stillman is a widely published, critically acclaimed writer. Her books include Blood Brothers (Ohioana Book Award Winner; Kirkus Reviews, starred review; “Best of the West 2018,” True West Magazine); Desert Reckoning (winner of the Spur and LA Press Club Awards for Nonfiction, an Amazon Editors Pick, based on a Rolling Stone piece), and Mustang, a Los Angeles Times Best Book of the Year. In addition, she wrote the cult classic,Twentynine Palms, a Los Angeles Times bestseller that Hunter Thompson called “A strange and brilliant story by an important American writer.” She writes the “Letter from the West” column for the Los Angeles Review of Books and her plays have been produced and won prizes around the country. She's a member of the core faculty at the UC Riverside-Palm Desert MFA Low Residency Creative Writing Program, where she teaches nonfiction. 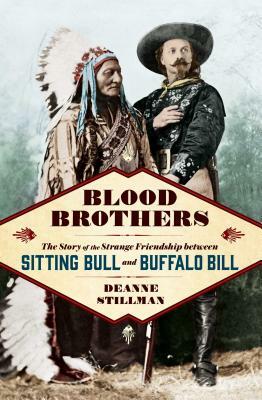 "Stillman gives an account of the tragic murder of Sitting Bull that’s as good as any in the literature. . . . Thoughtful and thoroughly well-told—just the right treatment for a subject about which many books have been written before, few so successfully." "Best of the West 2018. . . . Not to miss." "Splendid. . . . A strong sense of the spiritual power of place streams throughout. . . . [Stillman] has done a superb job capturing the essence of these two great Americans." "Deanne Stillman's work is like one of Georgia O’Keeffe’s landscapes, forcing a different perspective on the American West. Stillman re-catechizes our national mythology by putting symbols and personas that we already think we know into new light." "Deanne Stillman explores a historical anomaly with a researcher’s skill and a storyteller’s style." “Like a latter-day Joan Didion, Deanne Stillman has carved out an aspect of the American West. Not empty but populated by spirits, human and animal, the ghosts of lost tribes and now a fascinating culture clash only she could have offered." "Thoroughly researched, Stillman’s account of this period in American history is elucidating as well as entertaining."